"It is an objectionable habit to indulge in superlatives, but..."
‘Seran’ was designed by Higley Halliday M.I.N.A., the Chiswick based naval architect and marine motor engineer and built by Frank Maynard at Strand-on-the-Green Chiswick, between March and September 1926. An interesting tale passed from successive owners is that 'Seran' was commissioned by Owen Ramsay Nares (1888 – 1943), west end stage actor manager and matinée idol – and it's through this association she takes her name; 'Seran' being the reverse of 'Nares'. Nares performed with many of the outstanding actors of the era; his looks and debonair manner made him ideally suited to the silver screen. The development of the film industry and corresponding growth in cinema audiences gave Nares mass exposure and during his golden period of the 1920’s, he became a true matinée idol. In his autobiography “Myself - And Others” (1925), he describes an idyllic childhood at the family home, 'The Old House' in Sonning - ‘The Rose Garden of the Thames’ - which he describes as "one of the most beautiful of all places." He recalls that "from the age of three and a half until I was seventeen the greater part of my life was spent at Sonning, where I literally ran wild, either in or on the river." Nares later recalls entertaining a member of the Sforza family and "had the pleasure of showing him some of the beauties of the River Thames in the afternoon." Although the explanation (and provenance) of the name 'Seran' is intriguing, there is no documentary evidence to link Nares with 'Seran'. It’s notable that Halliday's original design was very much that of a river boat, as illustrated by her shallow draft and awning over the open cockpit. Nares did own a property at Nettlebed in the 1920’s, approximately four miles from Henley-on-Thames and, having starred in popular West End shows and touring productions almost without pause until January 1926, he set off with his own company for a tour of South Africa, not returning until October that year. Halliday’s original ink line drawing and general arrangement plans for ‘Seran’ dated March 1926 have survived and it’s clear that his final design was for Charles Clare Regnart (also known as Charles Hunter-Regnart) who, in early March 1926, was elected President of Maple & Co. Ltd., the furnishers of Tottenham Court Road, London. The timing would suggest that Regnart commissioned ‘Seran’ to mark the occasion. Her trial run was attended by journalists from The Motor Boat magazine who published their review in the 10 September 1926 edition, noting that “the owner has very definitely stated his requirements.” Although appearing to be a relatively conventional cruiser design of the period, ‘Seran’ included a number of unusual features. In particular, the yachting press were intrigued by the installation of twin ‘L6’ 16/20-h.p. Ailsa Craig petrol engines, which were described as “representing something of a novel equipment for a 35 ft. cruiser.” The ‘L6’ model, introduced in late 1925 was one of the smallest six cylinder marine motors to have been produced at the time. 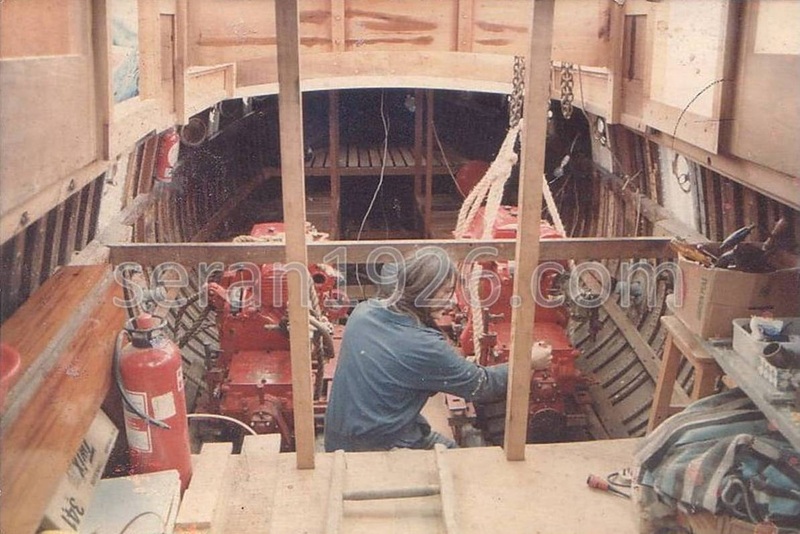 Whilst certainly novel, the installation of twin ‘L6’ engines in a 35 ft. motor yacht was not without precedent. Interestingly, a similar cruiser built by the Walton-on-Thames Launch Co. and reviewed by The Motor Boat in September 1925, was designed to 34 ft. 6 ins. overall, 8 ft. 6 ins. beam and 2 ft. 7 ins. draft (almost identical dimensions to ‘Seran’), with a “roomy” open cockpit and fitted with twin Ailsa Craig ‘L6’ 16/20-h.p. engines, specifically for cruising in the French canals. 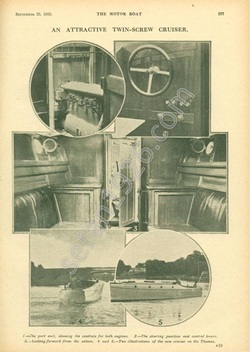 The Motor Boat argued that the vessel reflected “the most modern ideas in connection with small cruiser construction” and that the design was “considerably in advance of many contemporary boats”. 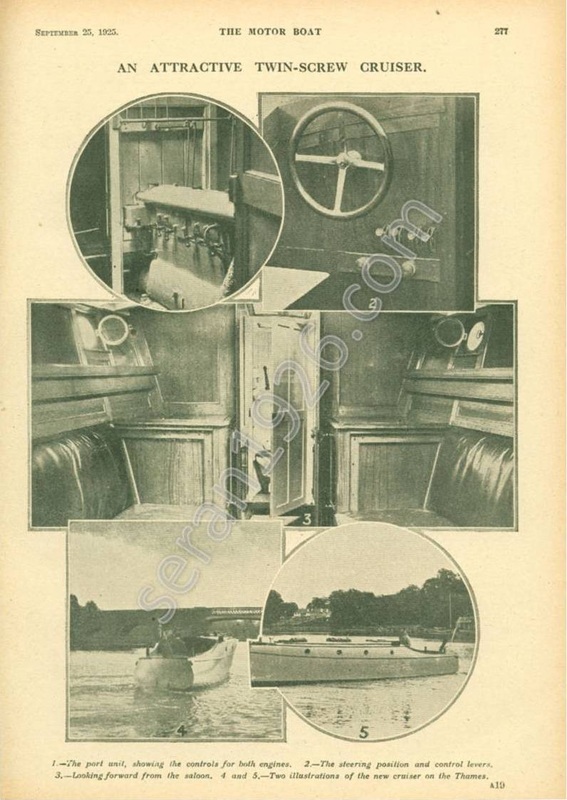 The motor yacht was exhibited at the Shipping, Machinery and Engineering Exhibition at Olympia in December 1925 and it’s possible that this was the inspiration for Halliday’s design of ‘Seran’. Another unusual feature was the inclusion of a sink designed for photographic purposes supplied with fresh water from the tanks. The cabin was also designed to double as a dark room for the development of photographic film. Regnart was a keen sea angler (Halliday’s design also included a spacious cockpit together with storage for rods, trawls and nets) and perhaps he intended to develop photographs of trophy catches. Interestingly the first compact 35mm camera, the ‘Leica I’, was released in 1925. Halliday instructed Frank Maynard of Strand-on-the-Green, Chiswick to undertake the build. He had entered into partnership with Maynard in 1911 and Maynard had built the majority of Halliday’s motor yacht designs. However, ‘Seran’ appears to have been the last of Halliday’s designs built at the yard, the partnership dissolving shortly afterwards. Halliday designed ‘Seran’ to 33 ft. with an open cockpit covered by awning. 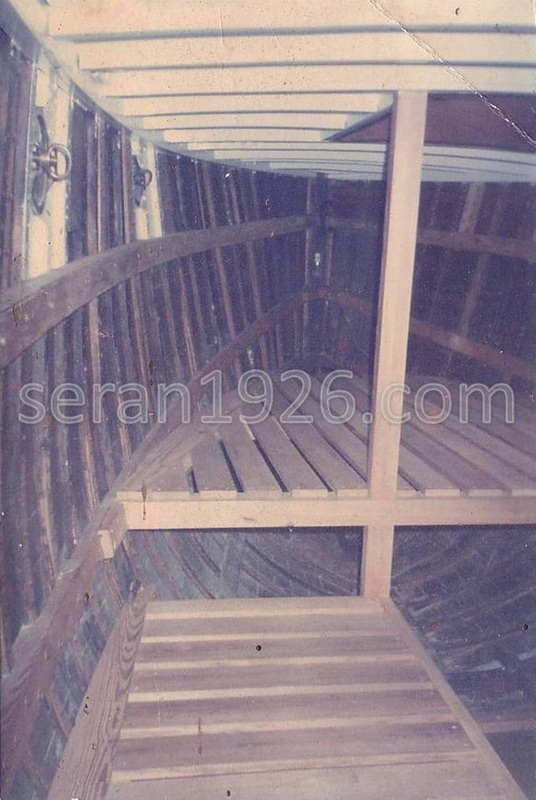 During construction the length was extended by 2 ft. to 35 ft. and a teak wheelhouse was built in place of the awning. ‘Seran’ was built to the highest specification, 1” teak planks on oak frames, copper fastened, with bronze fittings. The Motor Boat noted that the interior panelling was of "a very high order." Regnart was a member of the British Motor Boat Club which, in late 1925, took a lease on Cubitt’s dock, after which it was renamed ‘B.M.B.C. Dock’. It seems likely that Regnart kept ‘Seran’ on the Thames during 1927, possibly mooring her at B.M.B.C. Dock given its proximity to Maynard’s yard, taking her on day and overnight fishing expeditions in and around the Thames Estuary. Seran's wheel, clearly identifying her with the B.M.B.C. ‘Seran’ was first registered with the Port of London on 11 May 1928 with Official No. 160473. Several months later, a number of newspapers briefly reported Regnart’s success fishing from her in the Solent. Regnart may well have kept ‘Seran’ in the vicinity of Southampton Water during this period, where frequent fishing trips in and around the Solent would have been possible. In 1934 Regnart approached Halliday to make modifications to 'Seran' and the work was once again completed at Maynard's yard. This involved extending her nearly 5 ft. to 39 ft. 9 ins. overall with the addition of a more fashionable canoe stern replacing the original square transom design. The area covered by the former wheelhouse and open cockpit was enclosed by a single, low rectangular cabin and a higher bow was created to help prevent heavy water coming on board. The twin 'L6' Ailsa Craig engines were replaced with twin four cylinder Parsons petrol engines increasing the combined output to 56 h. p. The internal accommodation forward of the engine room was unchanged. Taken together, these modifications suggest Regnart's intended use of 'Seran' had changed from day or weekend coastal fishing trips to longer periods of extended cruising where the increased length would enhance her sea going qualities and where more comfortable, spacious accommodation would be required. 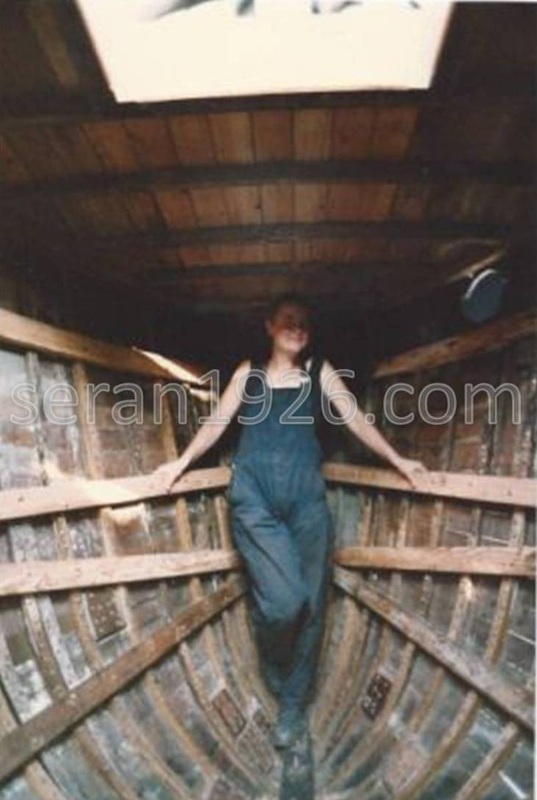 Her restoration in the 1980's revealed traces of copper sheathing beneath the bilge keels hinting that 'Seran' may have been moved to the Mediterranean - probably through the French canals - in the mid 1930's. Following the modifications, 'Seran' was re-registered with the Port of London in 1935, retaining her Official No. Unfortunately these records have been lost or destroyed. As the Lloyd's Registers of Yachts weren't published between 1939 and 1946 it is difficult to establish Seran's movements and ownership during this period. There is no record of her name being changed (which was not uncommon for requisitioned vessels) and there is no reference to 'Seran' having been requisitioned in War Office or Admiralty records (such as the Small Craft Service List) for Operation Dynamo or harbour patrol duties. It therefore seems likely that 'Seran' was either laid up in Autumn 1939 and remained immobilised for the duration of the War or, less likely but possible, that she was in neutral waters by 1939 - such as Ireland or Spain - and, as a result, was not requisitioned for the war effort. Whether or not this episode had any bearing on his decision, Wright parted with 'Seran' in 1956 and she was acquired by Les J. O'Connor of Llanelli, Carmarthenshire. He had established a steeplejack and steel pipe fabrication business with Fred Davies in 1948, trading as O'Connor & Davies Ltd. from the Old Castle Tin Plate Works in Llanelli and in nearby Port Talbot. O'Connor installed the current twin Lister Blackstone FR3M diesel engines in 1957 and constructed a more conventional high central wheelhouse with lower aft cabin, fitted with two single berths. He kept 'Seran' for a period at least, in Llanelli's North Dock and she is also remembered in Swansea harbour during this period. O'Connor owned ‘Seran’ for just a couple of years and she was subsequently sold to Rupert L. Griffin of Chaddesley Corbett, Worcestershire in 1958. She is remembered on a slipway at a yard on the Hamble around this time, with all her fixtures and fittings removed and in storage. On 7 June 1958 she was recorded passing Lizard Point bound for St. Ives. In the pre-war years, Griffin ran William Griffin & Sons (the family business), chain manufacturers based in Cradley Heath. In 1942 William Griffin & Sons and Woodhouse Bros. joined forces to manufacture the unique 'Integral Stud Link Chain', trading today as Griffin-Woodhouse Ltd., specialists in offshore moorings. Griffin owned 'Seran' until 1969 and was also the registered owner of the Dunkirk Little Ship 'Wairakei II' in the 1960's. Throughout the 1960's Griffin was a member of the Poole Harbour Yacht Club and so it seems likely that 'Seran' was kept on the south coast during this period. 'Seran' was acquired by Desmond C. H. Ross of Knightwick, Worcestershire in 1969. "Dizzy" Ross was a Captain in the Raiding Support Regiment, serving in the Adriatic 1944 - 1945, for which he was awarded the Military Cross. It seems likely that 'Seran' remained in the south west during his ownership, as on 31 July 1971 she was grounded on a sand bank in a heavy swell, on the Aberavon Beach side of the River Neath near the Mumbles and, although sustaining damage, was fortunately re-floated on the next tide. The Port Talbot coastguard recorded the grounding in their records. 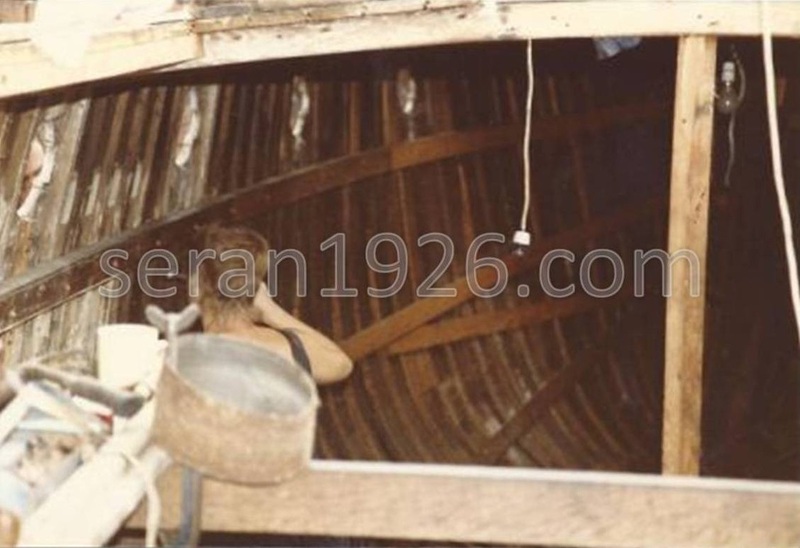 Although 'Seran' was re-floated, a number of her ribs were cracked and were not repaired until her restoration in the 1980’s. From 1972 ‘Seran’ was no longer recorded in the Lloyd’s Registers and it seems likely that Ross used ‘Seran’ little following the incident in 1971. Several years later in 1974, she was acquired by John Guest of Wolverhampton. Given her condition (and her subsequent location in 1984) it seems probable that ‘Seran’ was moved back to the River Severn during Guest’s ownership. Not much is known of this period but a dispute arose over unpaid license fees which resulted in Guest removing all fixtures and fittings from ‘Seran’ and abandoning her hull in the lower Stourport basin. “We had an idea that it would be great to live on a boat and so we were looking around at old narrowboats when we came across her. When we first saw Seran we fell in love with her. We could see that she had been a beauty in her days. We went onboard and could see the remains of what had been a lovely classic boat. We found out that she was up for tender with British Waterways and put in a bid. 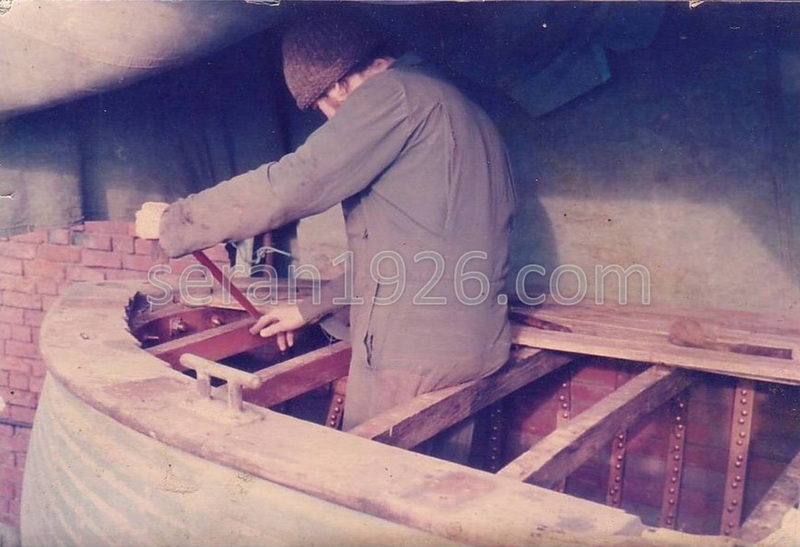 Knowing nothing of wooden boats at the time we threw in a postal tender and ending up buying her for about £300. We had to wait a few weeks till we heard whether our tender had been successful – it was as if our life depended on it – how on earth could we estimate what to offer or imagine what anyone else could have offered! When we heard we had been successful, we were overjoyed. We had the boat moved up from the middle basin in Stourport to the top basin which is where we cleaned her out (emptying bucket loads of mud back into the canal basin). You could see the water line along the cupboards in the saloon and the inside of the hull where she had been sunk and everything was covered in dried mud. A letter on board led us to Mr Guest who had everything that could have been unbolted from her in his garage (to prevent British Waterways having them) including the engines, which were lovingly rebuilt. There were all sorts – the portlights, the wheel, even the bronze letters for the name. What’s more, he still had the tailor-made water and fuel tanks. Even some bunting which I probably have got somewhere still! There was a pine mast which we used to support a cover whilst she was under renovation. I think it was just supposed to be for lights, not a sail. Eventually we had her lifted out on to the hard-standing to do the work on the hull. When we found 'Seran', her layout was quite different – the heads were right up in the bows, not that there were any fittings left. Then the galley had been behind, then the saloon, the engine room and the wheelhouse – which was much taller and further forward than the one that Richard built and then the back cabin. We changed the layout to suit our design and saved and used what we could – the cupboard doors and the bulkheads, for instance. I don’t know how long we spent re-building 'Seran', it completely took over our life. It really was a labour of love. The re-construction of the hull included re-placing 175 oak ribs, 9,000 copper nails (just about every fastening) all the keel bolts. A new stem and forefoot was built and we used oak re-claimed from an old church that was being demolished. The deck was stripped and re-canvassed and re-laid, I built the new teak wheelhouse and deck lights. We tried to use traditional techniques relative to the age of the boat wherever possible – like a red lead putty mix for filling the hull seams after caulking. 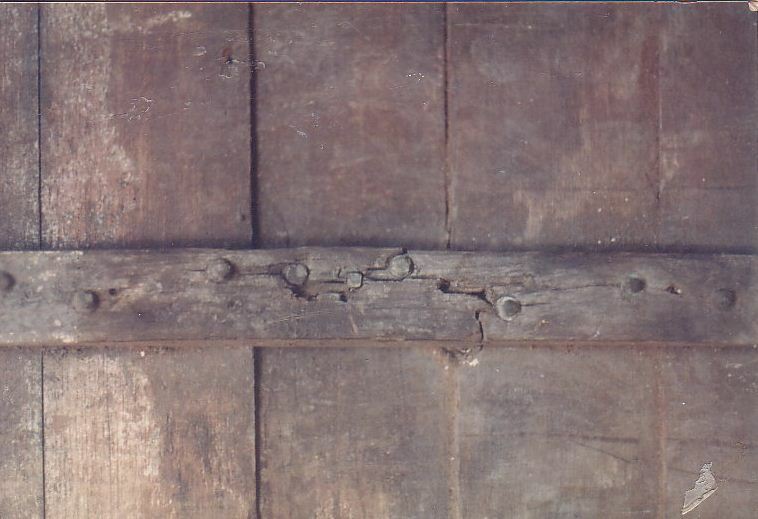 There was much evidence of filled rows of old copper nail holes where copper sheathing (for warm waters) had been put on. Under bilge keels and old fittings some of the copper remained. We used to collect every bit of old copper, brass and bronze from the removal of cracked ribs and other parts that needed replacing and take them in for scrap. The old wood we burnt in the caravan and it used to be gorgeous watching the flames with the beautiful colours as any bits of wood with copper still left in it burnt. The Fee’s took her on river and canal trips in the Midlands from Stourport down to Gloucester on the River Severn and on to Sharpness on the Sharpness Canal. In 1988, they moved her from the River Severn to the Calder and Hebble navigation in West Yorkshire (from Stourport to Newark by lorry). In Yorkshire they took 'Seran' from Mirfield to Goole and up to York on the tidal River Ouse. They intended to take her to sea and through the French canals. The Fee's lived aboard 'Seran' until 1992. In 1992 she was sold to Steve Monks of Strood, Kent who moved her to the River Medway where he lived aboard. In 2002, she was sold to Mick Killoran who also lived aboard, keeping her at Hoo Marina on the tidal Medway and taking her on coastal voyages to Brighton and Ramsgate as well as the swales and swatchways of the East Coast. Killoran subsequently acquired the Dunkirk Little Ship and converted lifeboat, 'Mary Scott'. The morning summer mist rises. The river ebbs, leaving its estuary, onwards to the sea. Birds calling . . . timeless. Their migrant ways . . . ageless. To this wild flow of natural beauty comes a work of love. Each piece of labour, joined and fashioned. There she lay, tied with rope to hold her fast. Built as strong as any castle on land. Her shape and lines calling for freedom. After more than seventy years, ‘Seran’ has returned to the River Thames. She was acquired by her current owner in 2010 and is kept on the non-tidal Thames in Berkshire, where she is gradually being restored. She attended the Thames Traditional Boat Rally at Henley-on-Thames in 2011 and 2013.